Our apartment Tettnang is a newly renovated gem. It has an area of ​​about 75 square meters plus terrace in a quiet position. The apartment is on the ground and / East facing north. It has 2 bedrooms, kitchen, bathroom and large living room. the morning sun and have plenty of space for recreation. The apartment has been almost completely renovated in winter 2016/2017 and is rented from spring 2017 the first time. All furniture, mattresses and fabrics are new. The outer facade was repainted in 2018. The modern kitchen with induction stove, refrigerator and microwave leaves nothing to be desired. Through the kitchen and the second Bedroom takes you to your patio. The next table, chairs and umbrella here loungers are available for you. The living room and master bedroom have modern plastic windows with shutters and fly screens. Kids will love the freedom! We provide them with children's travel cot and high chair at no charge ready. The house is located on the conservation area. No through traffic through impasse. Vineyard and lookout point directly behind the house. Private car park in front of the house. The hotel also includes free Wi-Fi. Town center, city park and bakers and butchers are a short walk away. Bed and table linen, towels and final cleaning are included in the price. The second Bedrooms can be separated. The standard price includes the large bedroom with double bed. Would you like the 2. Bedrooms also book, we charge 10, - EUR per day in addition. This room can be darkened by a blackout process. Promenade, natural lido (free for holiday makers) and ferry can be reached within 10-15 minutes. Rental of pedal boats, sailing and motor boats directly in Kressbronn. Diverse cultural and holiday offer by the local guest services. On arrival, you will receive your score card for this is EUR 1.50 per day per guest to pay a tax (on site upon arrival). • The tax is in the period from 01. April to 31st payable October for people aged 16 years. • Per person per day tourist tax is currently 1.50 EUR. • The guest card offers many advantages, such. As free admission to beach resorts, museums and exhibitions. Die Ferienwohnung liegt in Kressbronn in schöner und ruhiger Lage, wobei man in wenigen Gehminuten im Ort mit sämtlichen Einkaufsmöglichkeiten ist. Auch zum See und zum Bahnhof mit Verbindung nach Lindau bzw. Friedrichshafen ist es nicht weit. Ein Auto braucht man eigentlich nicht. Die Wohnung war tiptop sauber, modern eingerichtet und für 4 Personen ausreichend groß. Einzig kleiner Nachteil ist, dass WC und Bad nicht getrennt sind. Es hat uns sehr gut dort gefallen. Es hat -bis auf das Wetter- ALLES gepasst! In diese Fewo kann eine Familie sofort einziehen und leben - ohne lästige Kleinmengen an Vebrauchsmittel wie Salz, Spülmittel bzw. -Tabs, Filtertüten , Handwaschseife usw. mit zu führen.Uns gefiel auch die gute zentrale aber ruhige Lage. Wir waren mit unserer Ferienwohnung sehr zufrieden und können sie nur weiter empfehlen. Sauber, schön und gut gelegen! Bis auf den Essplatz im Durchgangsbereich sehr gute Raumaufteilung, alles super sauber und top gepflegt. Sehr ruhige Umgebung, alles, was man braucht, ist in 5 Minuten zu Fuß erreichbar. 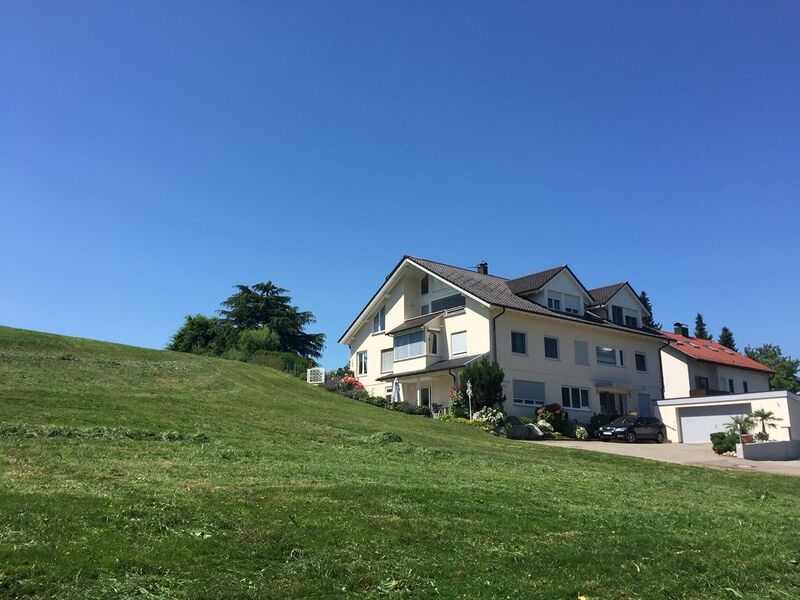 Die Ferienwohnung und der Bodensee und Umgebung waren einfach Super. Im Standardpreis ist das große Schlafzimmer mit Doppelbett enthalten Möchten Sie das 2. Schlafzimmer hinzubuchen, berechnen wir 10,- EUR pro Tag zusätzlich. Bitte teilen Sie uns Ihren Wunsch bei Buchung mit.